St Wolfgang was born into Royalty and received a good education; attending the celebrated monastic school of Reichenau Abbey. 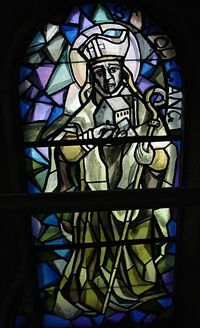 Initially, St Wolfgang became a teacher at the Cathedral School of Trier before joining the Benedictines. St Wolfgang was ordained a Priest by St Ulrich and afterwards, he travelled to Hungary as a missionary to help evangelise the people following a long succession of wars. In 972, St Wolfgang was appointed Bishop of Regensburg and became a greatly respected Pastor. Towards the end of his life, St Wolfgang yearned for a hermit style existence and withdrew to a quiet place hoping to end his days in prayer and penance. However, his hideaway was discovered and he was taken back to Regensburg to live among his community. St Wolfgang is regarded as one of the three great German Saints; the others being St Ulrich and St Conrad of Constance. His Feast Day is the 31st October. Pray that we will share our precious gift of time in prayer with our family, friends and community.